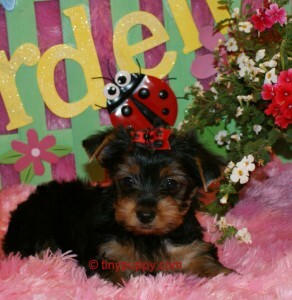 Meet our Little Yorkie Boy Aiden. 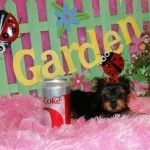 Aiden is 1.8 lbs at 7 weeks of age. He has a stunning coat and little eyes that will be sure to melt the hearts of any who hold him. Aiden’s Championship Bloodline Mom is just 4.5 lbs and his Daddy is a whopping 2.7 lbs. 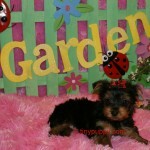 His grandfather is a Parti Yorkie out of the Nikkos Champion Lines. 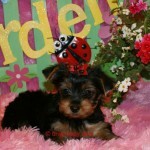 This little boy loves to be cuddled and held and has been socialized with both children and adults alike. Just think of the smile that he will put on your loved ones faces. Mother’s Day is right around the corner. $2800 Sold and loving my new home in Texas! 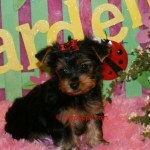 Little Yorkshire Terrier Aiden – Available now!